Arch Address Plaque with Pie Crust Border - - 19.5"W x 11.5"H wide arch shape personalized address sign. Penhurst Grande Arch Wall Plaque holds a one line address or a two line address. Made in USA. Made from rust-free cast aluminum. The one-line sign holds up to five (5) 4" characters. The two-line sign holds up to five (5) 4" characters on Line 1 and up to seventeen (17) 1.25" characters on Line 2. Decorative border matches the address color and accentuates the elegant arch shape. Finished with Alumi-Shield™ All Weather Coatings provides extra protection against harsh weather and environmental elements. Five color combinations: bronze with gold letters OG; black with gold letters BG; antique copper AC; green with gold letters GG; pewter with silver letters PS. For color AC antique copper, the plaque and characters are the same color so there is little contrast. Dimensions: 19.5 x 11.5 x .38. 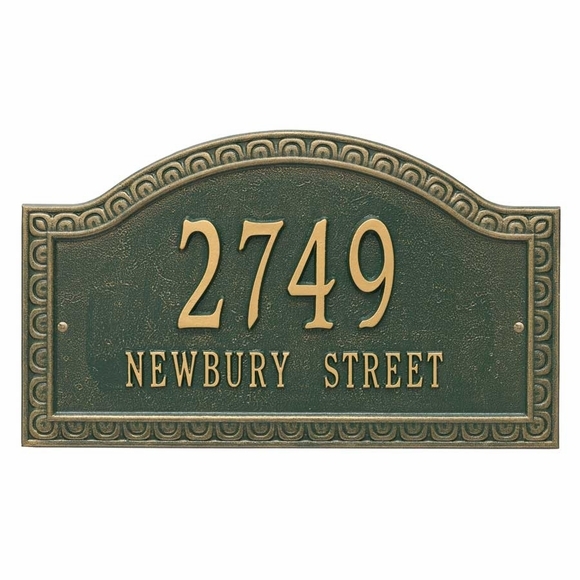 Personalized arch shape address sign holds one or two address lines. Wall mount.